We’ve been here near St. Gervais for three nights now and today seemed to be giving us a stunning blue sky. 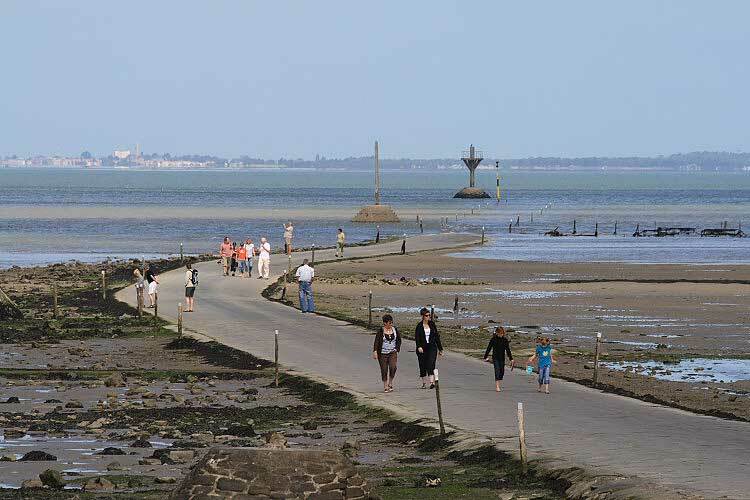 Neither of us is in any way a sailor but, given a daily shift of an hour or so between high tides, we reckoned the tide might be flooding the Passage du Gois (a submersible road) some time around 11:00 AM. Having cycled across it at basse mer (low tide) three days ago, we were keen to see what it looked like as the sea swallowed it. The channel itself looked very flat so we thought the advance of the water might be quite fast. It seems people do get caught out and stuck, too. We set off à bicyclette at about 10:30 AM. The warning lights were flashing as we approached the crossing. We had timed it perfectly; the previous low tide had been just before 9:00 AM. The comforting message, "danger area, rising tide", scrolled by in three languages (French, English, German). This was clearly quite a popular spectacle as quite a few people, including other nutters on bikes, gathered to watch the road disappear. Traffic was still crossing unhindered but eventually, as two 4x4s came across, through binoculars we saw spray starting to appear from their wheels. A couple of cars started crossing from our side, got almost half way, thought better of it, did an about turn, and returned. Very sensible! We had a feeling people liked to play chicken with the tide and be the last to cross but that may just be fanciful. Then a few people on bikes started riding down towards the advancing water, presumably just to watch. Well, why not indeed. Clearly the water wasn’t about to outrun us so we joined them. The water seemed to be flowing in one direction, right to left, which I imagine is because of the throttling effect of the narrow channel to the left of the Île de Noirmoutier. There’s no real reason this should be any more fascinating than simply watching the tide rise, I suppose, but it is a fascinating spectacle watching a road disappear. Our stunning blue sky was continuing so we set off again after a relaxing lunch for some more contrast and, perhaps, some local oysters. This time the contrast was windmills, modern wind generators versus the old 1703 flour mill, Le Petit Moulin de Châteauneuf, which we had seen yesterday. 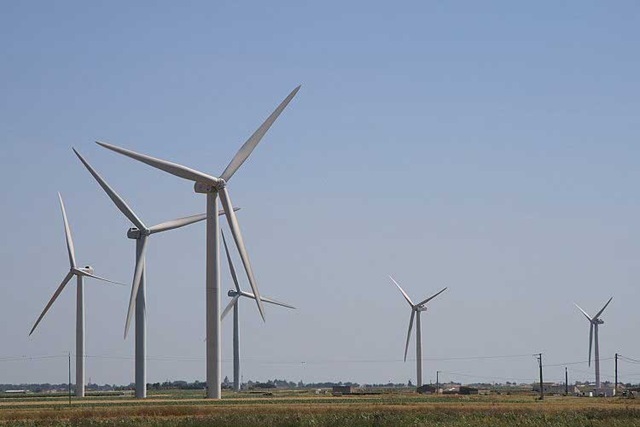 There is a "parc éolion" of eight very large wind generators right on the coast that we can see from our pitch. We could see these windmills were large but cycling directly beneath them was awesome. Each of the triple blades was 40 metres long. One revolution was taking approximately three seconds by my reckoning and the tips made what was, to me, a delightfully soft swishing sound as they descended towards us and passed. Now I’ve calculated the tip speed of the blades (anorak! ), I’m not surprised that they swished; they were doing about 300 kph. I was completely captivated. On our way back we found one of two or three oyster shacks open that proclaimed dégustation (tasting) but it had neither tables nor chairs. Brilliant! 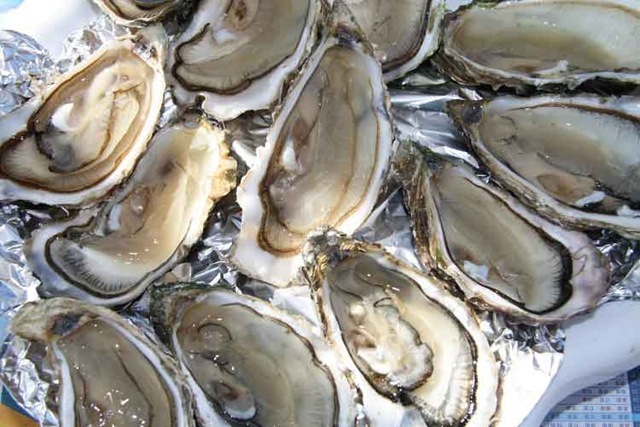 Opposite, however, by a sluice gate/lock, was a small bar/restaurant that did seafood and had tables and chairs so we sat and shared a dozen local oysters washed down with a glass of muscadet. These oysters were noticeably saltier than those we had tasted a few weeks ago at La Tremblade. We much preferred the ones from La Tremblade. Our brilliant day came to a disappointing end in the evening. The new and, I assume, inexperienced campsite owner, has let a travelling troop of British-registered Irish itinerants set up camp – five or six twin-axled vans swarming with rug-rats and satellite dishes. They’ve even got a steam-roller on a trailer! Peace, quiet and, more crucially, the feeling of security disappeared instantly. These folks are deliberately intimidating. I think everybody who can will be moving off tomorrow – we certainly are. The new owner is going to have to learn not to let such people onto his site. It’s a pity – we’d probably have come back here.